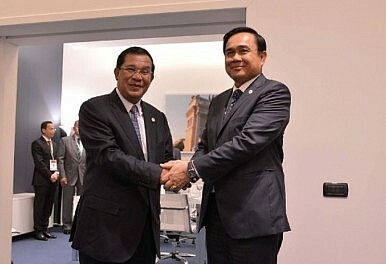 Thai Prime Minister Prayut Chan-o-cha, seen here with his Cambodian counterpart Hun Sen. When Will Thailand’s Elusive Election Be Held? The latest read on the ever-shifting timeline for Thailand’s election. In Thai Prime Minister Prayut Chan-o-cha’s first public address just over a week after the May 22 coup last year, he said that the ruling junta he led had a time frame of a year and three months to move towards elections. Yet as The Diplomat has been reporting, that deadline has been repeatedly delayed – first into 2016 and now into 2017 (See: “When Will Thailand Hold its Next Election?”). The rejection of a new draft constitution earlier this month was just the latest sign that the ruling junta is likely to extend its reign far longer than it had earlier indicated (See: “Thailand Completes Troubling New Constitution”). This week, Thai leaders suggested that polls would be held sometime in mid-2017, with a possibility of them being moved forward a few months. According to Reuters, Thai Prime Minister Prayut Chan-o-cha told reporters that the next general election could be organized around July 2017. Earlier, AFP had reported that Deputy Prime Minister Wissanu Krea-ngam had also said to a briefing for foreign diplomats in Bangkok that the time needed to get to an election would be around 20 months, putting it at roughly the same period around mid-2017. “The total number is 20. Hopefully in June 2017 we will have the general election And not too long, one month after that, we will have the new elected government,” he said. The 20-month process, dubbed the “6-4-6-4 road map to democracy,” would give the government six months to draft a new constitution, four months to hold a referendum on it, six months to draft organic laws to support the constitution and four months to campaign ahead of the election. Beyond this rough estimate, government officials also said the timeline could be shortened by a few months such that polls would be held in early 2017 instead of mid-2017. That may well be in reaction to international concerns – cited by Wissamu as well as Foreign Minister Don Pramudwinai – that the junta is merely seeking to prolong its power and has no intention of allowing polls to occur anytime soon. Wissanu reportedly said in his remarks to foreign diplomats that the 20-month process could be shortened to 16-18 months. Separately, according to The Nation, Prime Minister Prayuth Chan-o-cha also echoed Wissanu’s statement that the timeline could be shortened somewhat following a meeting. Prayuth suggested that the “6-4-6-4” formula could be changed to “4-3.5-4-3.5” instead, which would make for a total of 15 months instead of the initial 20. Given the ever-shifting timeline for Thailand’s election thus far though, observers can’t be blamed for not take the junta’s word for it. There are already signs that upcoming polls may be little more than a faux election.